A red rope adjustable rope bracelet with a cute little elephant in silver attached to it. The perfect gift for your daughter on her birthday! A cute bracelet with carnelian and turquoise beads and a tiny etched silver elephant. Your daughter will enjoy wearing this one and so will you! Colourful glass beads come together in this lovely sterling silver bracelet. Wear it with a white top and you're sure to make a statement. This charm bracelet is the perfect gift for your daughter on her birthday. A black rope adjustable bracelet with a square oxidised silver bead interspersed with carnelian orange beads to give it a contrasting look. The perfect bracelet for a casual day out. A lovely orange carnelian bracelet in triple lines to give you a funky look. Wear it with a black dress or a white shirt to make it stand out. A lovely amethyst pure bracelet interspersed with silver beads, smaller and bigger amethyst beads giving it a beautiful elegant feel. Wear it with neutral pastel shades to stand out. It's the perfect gift for your girl. Flattened silver and black onyx stones make up this lovely black onyx bracelet. Versatile and timeless, you can never go wrong when you get this one. Carnelian red stones and black onyx together make up this funky bracelet. Wear it with your black dress or top and you're sure to stand out. A nice silver heart charm bracelet in silver for the special girl in your life. A nice blue thread bracelet with an oxidised silver heart in the center. The perfect gift for your giirl who is a tad bit funky and doesn't like the usual cheesy gifts. The perfect bracelet to gift your girlfriend or wife, these simple and elegant bracelet cuffs with tear drop stones in red onyx, turquoise and amethyst are stylish yet elegant. You would love wearing it everyday! 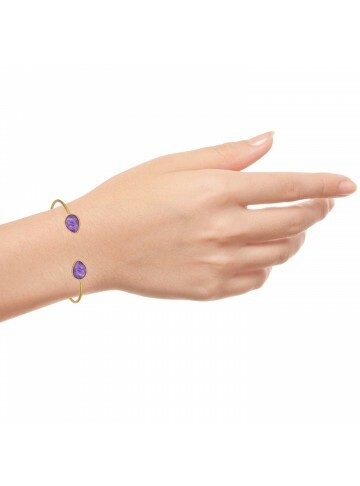 A simple and sleek silver bracelet gold plated with a tiny tear shaped design and a blue chalcedony stone. Also available in yellow chalcedony. A lovely thin golden bracelet, handmade in 925 silver with round beaded stones. Available in three lovely colours. This bracelet is the perfect gift! 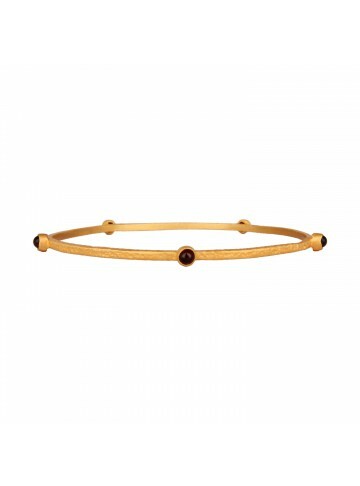 A lovely thin golden bracelet, handmade in 925 silver with round beaded stones. 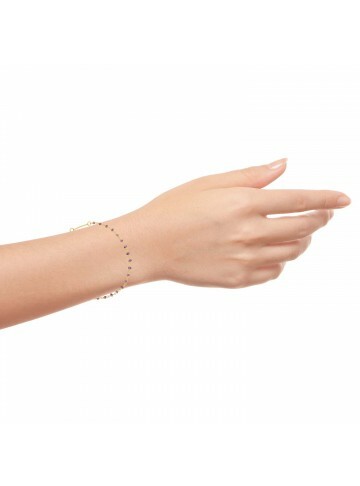 This bracelet is the perfect gift! A simple and sleek silver bracelet gold plated with a tiny tear shaped design and a yellow chalcedony stone. 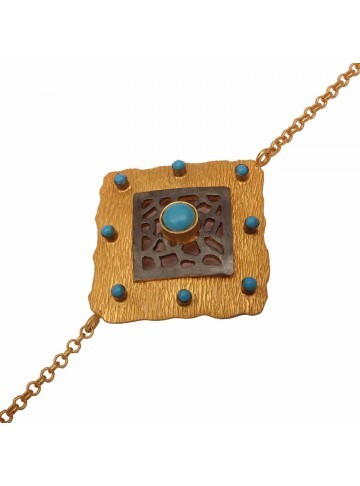 A simple and sleek silver bracelet gold plated with a tiny tear shaped design and a blue chalcedony stone. A classic silver bangle gold plated and interspersed with white mother of pearl stones. Handmade beautifully, this bangle can be worn just like that. Timeless and elegant, this bangle is truly a master piece. 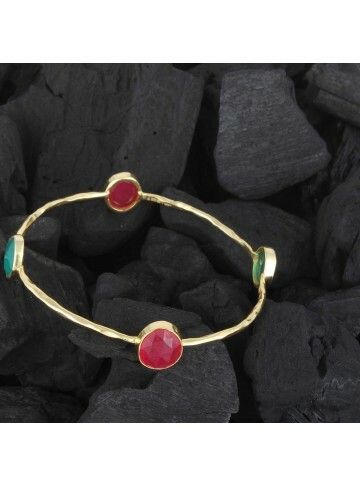 A classic silver bangle gold plated and interspersed with red and green onyx stones. Handmade beautifully, this bangle can be worn just like that. A lovely sleek colourful bracelet with semi-precious stones that can be worn everyday. You could wear it to work or a dinner! This bracelet is evergreen and classy. A cute beads bracelet with pink chalcedony stones, handmade in silver and gold plated. If you like stones in pink, this one if for you. A nice sleek tennis bracelet in gold plated silver with ruby beads. Lovely to wear on a date night! A simple handmade bracelet with differently sized beads and circular fan motifs. Perfect to give you that tribal look! Charming barrel shape orange Carnelian in a delicate chain for a perfect casual outfit. Delicate charming deep purple amethyst on a fine chain perfect for a casual evening! Just like a flower blooms so beautifully, this goldplated bracelet handmade to perfection gives you the same feeling. The white pearl stands out so perfectly in the petal. We love this one! Delicate and Evergreen, this Gold Plated bangle with round green garnets is a beautiful piece to add to your jewelry collection. A diamond shape bracelet with turquoise cushion stones and a touch of black rhodium. So delicate and bright you will love wearing it!